To continue my black jean series, I have paired the staple denims with new shoes and jackets and I show how to quickly go from day to night. 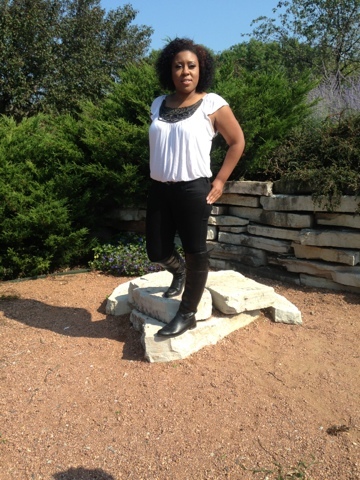 These riding boots I bought last fall from UrbanOG, are one of my favorite pairs of boots ever! Me being all of 5'4, i risk the chance of making myself look shorter in boots but black on black is not only slimming but it creates length. and although the boot passes my knee, it doesn't cut off my leg. SO let's switch it up a bit.. and add these booties from Forever21and this bigbuddah bag from Marshalls. First I am a diabetic so I need to carry bigger bags when I am out to house all my medicine and snacks in case my blood sugar is low. The booties immediately take the look from casual to more of a fabulous dressy casual. And when the night temperatures take over, throw on a fab jacket. I paired this one with this suede, diagonal zippered loose number from TJMAXX.. and paired it with the "uptown bag" from Justfab. You should know by now that I look at these pictures and thing "I could of done that differently" and with this look, the jeans are longer than me and i should have tucked them into the bootie. Make sure you do that lol because because the bunching at the ankle isn't ideal in creating the apperance of a longer leg. This uber chic, embroidered neck line blouse is from Forever21. In my hair I used Cantu shea butter hair lotion for natural hair. Do you see how beautiful my curls are in the sun lol LOVE IT!! Hope these ideas where helpful! !